Pantoprazole sodium sesquihydrate is a white to off-white crystalline powder and is racemic. Pantoprazole has weakly basic and acidic properties. Pantoprazole sodium sesquihydrate is freely soluble in water, very slightly soluble in phosphate buffer at pH 7.4, and practically insoluble in nâ€‘hexane. The stability of the compound in aqueous solution is pH-dependent. The rate of degradation increases with decreasing pH. At ambient temperature, the degradation half-life is approximately 2.8 hours at pH 5.0 and approximately 220 hours at pH 7.8. Pantoprazole sodium is supplied as a delayed-release tablet for oral administration, available in 2 strengths. Each delayed-release tablet contains 45.1 mg or 22.6 mg of pantoprazole sodium sesquihydrate (equivalent to 40 mg or 20 mg pantoprazole, respectively) with the following inactive ingredients: calcium stearate, crospovidone, hypromellose, iron oxide, mannitol, methacrylic acid copolymer, polysorbate 80, povidone, propylene glycol, sodium carbonate, sodium lauryl sulfate, titanium dioxide, and triethyl citrate. Pantoprazole Sodium Delayedâ€‘Release tablets (40 mg and 20 mg) complies with USP dissolution test 2. Pantoprazole sodium is prepared as an enteric-coated tablet so that absorption of pantoprazole begins only after the tablet leaves the stomach. Peak serum concentration (Cmax) and area under the serum concentration time curve (AUC) increase in a manner proportional to oral and intravenous doses from 10 mg to 80 mg. Pantoprazole does not accumulate and its pharmacokinetics are unaltered with multiple daily dosing. Following oral or intravenous administration, the serum concentration of pantoprazole declines biexponentially with a terminal elimination half-life of approximately one hour. In extensive metabolizers (see CLINICAL PHARMACOLOGY, Pharmacokinetics, Metabolism) with normal liver function receiving an oral dose of the enteric-coated 40 mg pantoprazole tablet, the peak concentration (Cmax) is 2.5 Î¼g/mL, the time to reach the peak concentration (tmax) is 2.5 h and the total area under the plasma concentration versus time curve (AUC) is 4.8 Î¼g·hr/mL. When pantoprazole is given with food, its tmax is highly variable and may increase significantly. Following intravenous administration of pantoprazole to extensive metabolizers, its total clearance is 7.6-14.0 L/h and its apparent volume of distribution is 11.0-23.6 L.
The absorption of pantoprazole is rapid, with a Cmax of 2.5 Î¼g/mL that occurs approximately 2.5 hours after administration of a single or multiple oral 40-mg doses of pantoprazole sodium delayed-release tablets. Pantoprazole is well absorbed; it undergoes little first-pass metabolism resulting in an absolute bioavailability of approximately 77%. Pantoprazole absorption is not affected by concomitant administration of antacids. Administration of pantoprazole with food may delay its absorption up to 2 hours or longer; however, the Cmax and the extent of pantoprazole absorption (AUC) are not altered. Thus, pantoprazole may be taken without regard to timing of meals. Pantoprazole is extensively metabolized in the liver through the cytochrome P450 (CYP) system. Pantoprazole metabolism is independent of the route of administration (intravenous or oral). The main metabolic pathway is demethylation, by CYP2C19, with subsequent sulfation; other metabolic pathways include oxidation by CYP3A4. There is no evidence that any of the pantoprazole metabolites have significant pharmacologic activity. CYP2C19 displays a known genetic polymorphism due to its deficiency in some sub-populations (eg, 3% of Caucasians and African-Americans and 17%-23% of Asians). Although these sub-populations of slow pantoprazole metabolizers have elimination half-life values of 3.5 to 10.0 hours, they still have minimal accumulation (â‰¤ 23%) with once daily dosing. After a single oral or intravenous dose of 14C-labeled pantoprazole to healthy, normal metabolizer volunteers, approximately 71% of the dose was excreted in the urine with 18% excreted in the feces through biliary excretion. There was no renal excretion of unchanged pantoprazole. Only slight to moderate increases in pantoprazole AUC (43%) and Cmax (26%) were found in elderly volunteers (64 to 76 years of age) after repeated oral administration, compared with younger subjects. No dosage adjustment is recommended based on age. The pharmacokinetics of pantoprazole have not been investigated in patients < 18 years of age. There is a modest increase in pantoprazole AUC and Cmax in women compared to men. However, weight-normalized clearance values are similar in women and men. No dosage adjustment is needed based on gender (see PRECAUTIONS, Use in Women). In patients with mild to severe hepatic impairment, maximum pantoprazole concentrations increased only slightly (1.5-fold) relative to healthy subjects. Although serum half-life values increased to 7-9 hours and AUC values increased by 5- to 7-fold in hepatic-impaired patients, these increases were no greater than those observed in slow CYP2C19 metabolizers, where no dosage frequency adjustment is warranted. These pharmacokinetic changes in hepatic-impaired patients result in minimal drug accumulation following once daily multiple-dose administration. No dosage adjustment is needed in patients with mild to severe hepatic impairment. Doses higher than 40 mg/day have not been studied in hepatically-impaired patients. Pantoprazole is metabolized mainly by CYP2C19 and to minor extents by CYPs 3A4, 2D6, and 2C9. In in vivo drug-drug interaction studies with CYP2C19 substrates (diazepam [also a CYP3A4 substrate] and phenytoin [also a CYP3A4 inducer]), nifedipine, midazolam, and clarithromycin (CYP3A4 substrates), metoprolol (a CYP2D6 substrate), diclofenac, naproxen and piroxicam (CYP2C9 substrates), and theophylline (a CYP1A2 substrate) in healthy subjects, the pharmacokinetics of pantoprazole were not significantly altered. It is, therefore, expected that other drugs metabolized by CYPs 2C19, 3A4, 2D6, 2C9, and 1A2 would not significantly affect the pharmacokinetics of pantoprazole. In vivo studies also suggest that pantoprazole does not significantly affect the kinetics of other drugs (cisapride, theophylline, diazepam [and its active metabolite, desmethyldiazepam], phenytoin, warfarin, metoprolol, nifedipine, carbamazepine, midazolam, clarithromycin, naproxen, piroxicam, and oral contraceptives [levonorgestrel/ethinyl estradiol]) metabolized by CYPs 2C19, 3A4, 2C9, 2D6, and 1A2. Therefore, it is expected that pantoprazole would not significantly affect the pharmacokinetics of other drugs metabolized by these isozymes. Dosage adjustment of such drugs is not necessary when they are coadministered with pantoprazole. In other in vivo studies, digoxin, ethanol, glyburide, antipyrine, caffeine, metronidazole, and amoxicillin had no clinically relevant interactions with pantoprazole. Although no significant drug-drug interactions have been observed in clinical studies, the potential for significant drug-drug interactions with more than once daily dosing with high doses of pantoprazole has not been studied in poor metabolizers or individuals who are hepatically impaired. Pantoprazole is a proton pump inhibitor (PPI) that suppresses the final step in gastric acid production by covalently binding to the (H+,K+)-ATPase enzyme system at the secretory surface of the gastric parietal cell. This effect leads to inhibition of both basal and stimulated gastric acid secretion irrespective of the stimulus. The binding to the (H+,K+)-ATPase results in a duration of antisecretory effect that persists longer than 24 hours for all doses tested. Under maximal acid stimulatory conditions using pentagastrin, a dose-dependent decrease in gastric acid output occurs after a single dose of oral (20-80 mg) or a single dose of intravenous (20-120 mg) pantoprazole in healthy volunteers. Pantoprazole given once daily results in increasing inhibition of gastric acid secretion. Following the initial oral dose of 40 mg pantoprazole, a 51% mean inhibition was achieved by 2.5 hours. With once a day dosing for 7 days the mean inhibition was increased to 85%. Pantoprazole suppressed acid secretion in excess of 95% in half of the subjects. Acid secretion had returned to normal within a week after the last dose of pantoprazole; there was no evidence of rebound hypersecretion. In a series of dose-response studies pantoprazole, at oral doses ranging from 20 to 120 mg, caused dose-related increases in median basal gastric pH and in the percent of time gastric pH was > 3 and > 4. Treatment with 40 mg of pantoprazole produced optimal increases in gastric pH which were significantly greater than the 20-mg dose. Doses higher than 40 mg (60, 80, 120 mg) did not result in further significant increases in median gastric pH. The effects of pantoprazole on median pH from one double-blind crossover study are shown below. Fasting serum gastrin levels were assessed in two double-blind studies of the acute healing of erosive esophagitis (EE) in which 682 patients with gastroesophageal reflux disease (GERD) received 10, 20, or 40 mg of pantoprazole sodium for up to 8 weeks. At 4 weeks of treatment there was an increase in mean gastrin levels of 7%, 35%, and 72% over pretreatment values in the 10, 20, and 40 mg treatment groups, respectively. A similar increase in serum gastrin levels was noted at the 8 week visit with mean increases of 3%, 26%, and 84% for the three pantoprazole dose groups. Median serum gastrin levels remained within normal limits during maintenance therapy with pantoprazole sodium delayed-release tablets. Following healing of gastric or duodenal ulcers with pantoprazole treatment, elevated gastrin levels return to normal by at least 3 months. In 39 patients treated with oral pantoprazole 40 mg to 240 mg daily (majority receiving 40 mg to 80 mg) for up to 5 years, there was a moderate increase in ECL-cell density starting after the first year of use which appeared to plateau after 4 years. No clinically relevant effects of pantoprazole on cardiovascular, respiratory, ophthalmic, or central nervous system function have been detected. In a clinical pharmacology study, pantoprazole 40 mg given once daily for 2 weeks had no effect on the levels of the following hormones: cortisol, testosterone, triiodothyronine (T3), thyroxine (T4), thyroid-stimulating hormone (TSH), thyronine-binding protein, parathyroid hormone, insulin, glucagon, renin, aldosterone, follicle-stimulating hormone, luteinizing hormone, prolactin, and growth hormone. Pantoprazole sodium delayed-release tablets were used in all clinical trials. + (p < 0.001) pantoprazole sodium versus placebo. * (p < 0.05) versus 10 mg, or 20 mg pantoprazole sodium. # (p < 0.05) versus 10 mg pantoprazole sodium. In this study, all pantoprazole sodium treatment groups had significantly greater healing rates than the placebo group. This was true regardless of H. pylori status for the 40-mg and 20-mg pantoprazole sodium treatment groups. The 40-mg dose of pantoprazole sodium resulted in healing rates significantly greater than those found with either the 20- or 10-mg dose. A significantly greater proportion of patients taking pantoprazole sodium 40 mg experienced complete relief of daytime and nighttime heartburn and the absence of regurgitation starting from the first day of treatment compared with placebo. Patients taking pantoprazole sodium consumed significantly fewer antacid tablets per day than those taking placebo. + (p < 0.001) pantoprazole sodium versus nizatidine. Once daily treatment with pantoprazole sodium 40 mg or 20 mg resulted in significantly superior rates of healing at both 4 and 8 weeks compared with twice daily treatment with 150 mg of nizatidine. For the 40 mg treatment group, significantly greater healing rates compared to nizatidine were achieved regardless of the H. pylori status. A significantly greater proportion of the patients in the pantoprazole sodium treatment groups experienced complete relief of nighttime heartburn and regurgitation starting on the first day and of daytime heartburn on the second day compared with those taking nizatidine 150 mg twice daily. Patients taking pantoprazole sodium consumed significantly fewer antacid tablets per day than those taking nizatidine. Two independent, multicenter, randomized, double-blind, comparator-controlled trials of identical design were conducted in GERD patients with endoscopically-confirmed healed erosive esophagitis to demonstrate efficacy of pantoprazole sodium in long-term maintenance of healing. The two U.S. studies enrolled 386 and 404 patients, respectively, to receive either 10 mg, 20 mg, or 40 mg of pantoprazole sodium delayed-release tablets once daily or 150 mg of ranitidine twice daily. As demonstrated in the table below, pantoprazole sodium 40 mg and 20 mg were significantly superior to ranitidine at every time point with respect to the maintenance of healing. In addition, pantoprazole sodium 40 mg was superior to all other treatments studied. Note: Pantoprazole sodium 10 mg was superior (p < 0.05) to ranitidine in study 2 but not study 1. Pantoprazole sodium 40 mg was superior to ranitidine in reducing the number of daytime and nighttime heartburn episodes from the first through the twelfth month of treatment. Pantoprazole sodium 20 mg, administered once daily, was also effective in reducing episodes of daytime and nighttime heartburn in one trial. In a multicenter, open-label trial of 35 patients with pathological hypersecretory conditions, such as Zollinger-Ellison syndrome with or without multiple endocrine neoplasia-type I, pantoprazole sodium successfully controlled gastric acid secretion. Doses ranging from 80 mg daily to 240 mg daily maintained gastric acid output below 10 mEq/h in patients without prior acid-reducing surgery and below 5 mEq/h in patients with prior acid-reducing surgery. Doses were initially titrated to the individual patient needs, and adjusted in some patients based on the clinical response with time (see DOSAGE AND ADMINISTRATION). Pantoprazole sodium was well tolerated at these dose levels for prolonged periods (greater than 2 years in some patients). Pantoprazole sodium delayed-release tablets are indicated for the short-term treatment (up to 8 weeks) in the healing and symptomatic relief of erosive esophagitis. For those patients who have not healed after 8 weeks of treatment, an additional 8-week course of pantoprazole sodium may be considered. Pantoprazole sodium delayed-release tablets are indicated for maintenance of healing of erosive esophagitis and reduction in relapse rates of daytime and nighttime heartburn symptoms in patients with gastroesophageal reflux disease (GERD). Controlled studies did not extend beyond 12 months. Pantoprazole sodium delayed-release tablets are indicated for the long-term treatment of pathological hypersecretory conditions, including Zollinger-Ellison syndrome. Pantoprazole sodium delayed-release tablets are contraindicated in patients with known hypersensitivity to any component of the formulation. Owing to the chronic nature of erosive esophagitis, there may be a potential for prolonged administration of pantoprazole. In long-term rodent studies, pantoprazole was carcinogenic and caused rare types of gastrointestinal tumors. The relevance of these findings to tumor development in humans is unknown. Generally, daily treatment with any acid-suppressing medications over a long period of time (eg, longer than 3 years) may lead to malabsorption of cyanocobalamin (Vitamin B-12) caused by hypo- or achlorhydria. Rare reports of cyanocobalamin deficiency occurring with acid-suppressing therapy have been reported in the literature. This possibility should be considered if clinical symptoms consistent with cyanocobalamin deficiency are observed. Atrophic gastritis has been noted occasionally in gastric corpus biopsies from patients treated long-term with pantoprazole, particularly in patients who were H. pylori positive. Patients should be cautioned that pantoprazole sodium delayed-release tablets SHOULD NOT BE SPLIT, CRUSHED OR CHEWED. The tablets should be swallowed whole, with or without food in the stomach. Concomitant administration of antacids does not affect the absorption of pantoprazole. Pantoprazole is metabolized through the cytochrome P450 system, primarily the CYP2C19 and CYP3A4 isozymes, and subsequently undergoes Phase II conjugation (see CLINICAL PHARMACOLOGY, Drug-Drug Interactions). Based on studies evaluating possible interactions of pantoprazole with other drugs, no dosage adjustment is needed with concomitant use of the following: theophylline, cisapride, antipyrine, caffeine, carbamazepine, diazepam (and its active metabolite, desmethyldiazepam), diclofenac, naproxen, piroxicam, digoxin, ethanol, glyburide, an oral contraceptive (levonorgestrel/ethinyl estradiol), metoprolol, nifedipine, phenytoin, warfarin (see below), midazolam, clarithromycin, metronidazole, or amoxicillin. Clinically relevant interactions of pantoprazole with other drugs with the same metabolic pathways are not expected. Therefore, when coadministered with pantoprazole, adjustment of the dosage of pantoprazole or of such drugs may not be necessary. There was also no interaction with concomitantly administered antacids. There have been postmarketing reports of increased INR and prothrombin time in patients receiving proton pump inhibitors, including pantoprazole, and warfarin concomitantly. Increases in INR and prothrombin time may lead to abnormal bleeding and even death. Patients treated with proton pump inhibitors and warfarin concomitantly should be monitored for increases in INR and prothrombin time. Concomitant use of atazanavir and proton pump inhibitors is not recommended. Coadministration of atazanavir with proton pump inhibitors is expected to substantially decrease atazanavir plasma concentrations and thereby reduce its therapeutic effect. Because of profound and long lasting inhibition of gastric acid secretion, pantoprazole may interfere with absorption of drugs where gastric pH is an important determinant of their bioavailability (eg, ketoconazole, ampicillin esters, and iron salts). In a 24-month carcinogenicity study, Sprague-Dawley rats were treated orally with doses of 0.5 to 200 mg/kg/day, about 0.1 to 40 times the exposure on a body surface area basis of a 50-kg person dosed at 40 mg/day. In the gastric fundus, treatment at 0.5 to 200 mg/kg/day produced enterochromaffin-like (ECL) cell hyperplasia and benign and malignant neuroendocrine cell tumors in a dose-related manner. In the forestomach, treatment at 50 and 200 mg/kg/day (about 10 and 40 times the recommended human dose on a body surface area basis) produced benign squamous cell papillomas and malignant squamous cell carcinomas. Rare gastrointestinal tumors associated with pantoprazole treatment included an adenocarcinoma of the duodenum at 50 mg/kg/day, and benign polyps and adenocarcinomas of the gastric fundus at 200 mg/kg/day. In the liver, treatment at 0.5 to 200 mg/kg/day produced dose-related increases in the incidences of hepatocellular adenomas and carcinomas. In the thyroid gland, treatment at 200 mg/kg/day produced increased incidences of follicular cell adenomas and carcinomas for both male and female rats. Sporadic occurrences of hepatocellular adenomas and a hepatocellular carcinoma were observed in Sprague-Dawley rats exposed to pantoprazole in 6-month and 12-month toxicity studies. Teratology studies have been performed in rats at oral doses up to 450 mg/kg/day (88 times the recommended human dose based on body surface area) and rabbits at oral doses up to 40 mg/kg/day (16 times the recommended human dose based on body surface area) and have revealed no evidence of impaired fertility or harm to the fetus due to pantoprazole. There are, however, no adequate and well-controlled studies in pregnant women. Because animal reproduction studies are not always predictive of human response, this drug should be used during pregnancy only if clearly needed. Erosive esophagitis healing rates in the 221 women treated with pantoprazole sodium delayed-release tablets in U.S. clinical trials were similar to those found in men. In the 122 women treated long-term with pantoprazole sodium 40 mg or 20 mg, healing was maintained at a rate similar to that in men. The incidence rates of adverse events were also similar for men and women. In short-term U.S. clinical trials, erosive esophagitis healing rates in the 107 elderly patients (â‰¥ 65 years old) treated with pantoprazole sodium were similar to those found in patients under the age of 65. The incidence rates of adverse events and laboratory abnormalities in patients aged 65 years and older were similar to those associated with patients younger than 65 years of age. Worldwide, more than 11,100 patients have been treated with pantoprazole in clinical trials involving various dosages and duration of treatment. In general, pantoprazole has been well tolerated in both short-term and long-term trials. In two U.S. controlled clinical trials involving pantoprazole sodium 10, 20, or 40 mg doses for up to 8 weeks, there were no dose-related effects on the incidence of adverse events. The following adverse events considered by investigators to be possibly, probably, or definitely related to drug occurred in 1% or more in the individual studies of GERD patients on therapy with pantoprazole sodium. Note: Only adverse events with an incidence greater than or equal to the comparators are shown. In international short-term, double-blind or open-label clinical trials involving 20 mg to 80 mg per day, the following adverse events were reported to occur in 1% or more of 2805 GERD patients receiving pantoprazole for up to 8 weeks. In two U.S. controlled clinical trials involving pantoprazole sodium 10, 20, or 40 mg doses for up to 12 months, the following adverse events considered by investigators to be possibly, probably, or definitely related to drug occurred in 1% or more of GERD patients on long-term therapy. In addition, in these short- and long-term domestic and international trials, the following treatment-emergent events, regardless of causality, occurred at a rate of â‰¥ 1% in pantoprazole-treated patients: anxiety, arthralgia, asthenia, back pain, bronchitis, chest pain, constipation, cough increased, dizziness, dyspepsia, dyspnea, flu syndrome, gastroenteritis, gastrointestinal disorder, hyperlipemia, hypertonia, infection, liver function tests abnormal, migraine, nausea, neck pain, pain, pharyngitis, rectal disorder, rhinitis, SGPT increased, sinusitis, upper respiratory tract infection, urinary frequency, urinary tract infection, and vomiting. Additional treatment-emergent adverse experiences occurring in < 1% of pantoprazole-treated patients from these trials are listed below by body system. In most instances the relationship to pantoprazole was unclear. BODY AS A WHOLE: abscess, allergic reaction, chills, cyst, face edema, fever, generalized edema, heat stroke, hernia, laboratory test abnormal, malaise, moniliasis, neoplasm, non-specified drug reaction, photosensitivity reaction. CARDIOVASCULAR SYSTEM: abnormal electrocardiogram, angina pectoris, arrhythmia, atrial fibrillation/flutter, cardiovascular disorder, chest pain substernal, congestive heart failure, hemorrhage, hypertension, hypotension, myocardial infarction, myocardial ischemia, palpitation, retinal vascular disorder, syncope, tachycardia, thrombophlebitis, thrombosis, vasodilatation. NERVOUS SYSTEM: abnormal dreams, confusion, convulsion, depression, dry mouth, dysarthria, emotional lability, hallucinations, hyperkinesia, hypesthesia, libido decreased, nervousness, neuralgia, neuritis, neuropathy, paresthesia, reflexes decreased, sleep disorder, somnolence, thinking abnormal, tremor, vertigo. SKIN AND APPENDAGES: acne, alopecia, contact dermatitis, dry skin, eczema, fungal dermatitis, hemorrhage, herpes simplex, herpes zoster, lichenoid dermatitis, maculopapular rash, pruritus, skin disorder, skin ulcer, sweating, urticaria. In an open-label US clinical trial conducted in 35 patients with pathological hypersecretory conditions treated with pantoprazole sodium for up to 27 months, the adverse events reported were consistent with the safety profile of the drug in other populations. In two U.S. controlled, short-term trials in patients with erosive esophagitis associated with GERD, 0.4% of the patients on pantoprazole sodium 40 mg experienced SGPT elevations of greater than three times the upper limit of normal at the final treatment visit. In two U.S. controlled, long-term trials in patients with erosive esophagitis associated with GERD, none of 178 patients (0%) on pantoprazole sodium 40 mg and two of 181 patients (1.1%) on pantoprazole sodium 20 mg experienced significant transaminase elevations at 12 months (or earlier if a patient discontinued prematurely). Significant elevations of SGOT or SGPT were defined as values at least three times the upper limit of normal that were non-sporadic and had no clear alternative explanation. The following changes in laboratory parameters were reported as adverse events: creatinine increased, hypercholesterolemia, and hyperuricemia. Experience in patients taking very high doses of pantoprazole is limited. There have been spontaneous reports of overdosage with pantoprazole, including a suicide in which pantoprazole 560 mg and undetermined amounts of chloroquine and zopiclone were also ingested. There have also been spontaneous reports of patients taking similar amounts of pantoprazole (400 mg and 600 mg) with no adverse effects. The recommended adult oral dose is 40 mg given once daily for up to 8 weeks. For those patients who have not healed after 8 weeks of treatment, an additional 8-week course of pantoprazole sodium may be considered (see INDICATIONS AND USAGE). The recommended adult oral dose is one pantoprazole sodium 40 mg delayed-release tablet, taken daily (see CLINICAL PHARMACOLOGY, Clinical Studies). The dosage of pantoprazole sodium in patients with pathological hypersecretory conditions varies with the individual patient. The recommended adult starting dose is 40 mg twice daily. Dosage regimens should be adjusted to individual patient needs and should continue for as long as clinically indicated. Doses up to 240 mg daily have been administered. Some patients have been treated continuously with pantoprazole sodium for more than 2 years. Pantoprazole sodium delayed-release tablets should be swallowed whole, with or without food in the stomach. If patients are unable to swallow a 40 mg tablet, two 20 mg tablets may be taken. Concomitant administration of antacids does not affect the absorption of pantoprazole sodium. Patients should be cautioned that pantoprazole sodium delayed-release tablets should not be split, chewed or crushed. 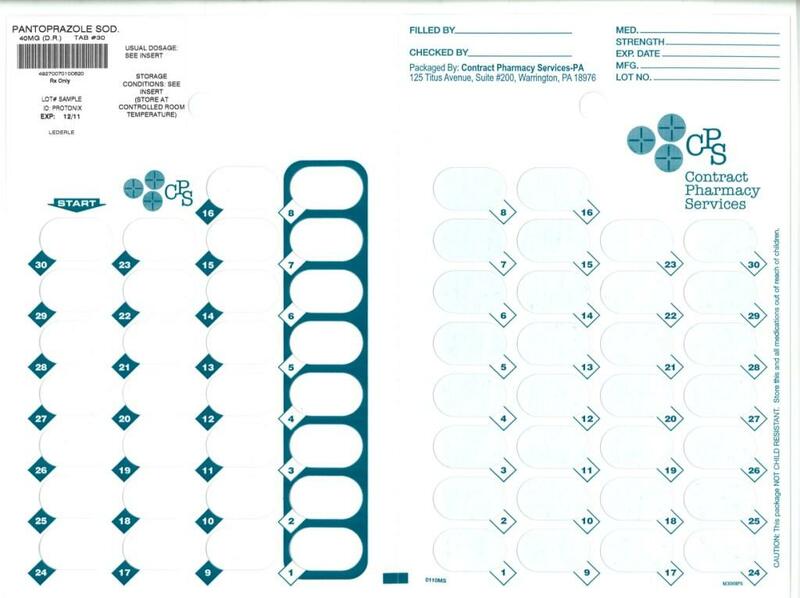 Pantoprazole sodium delayed-release tablets are supplied as 40 mg yellow oval biconvex delayedâ€‘release tablets imprinted with PROTONIX (brown ink) on one side. United States Patent Numbers: 4,758,579; 5,997,903.